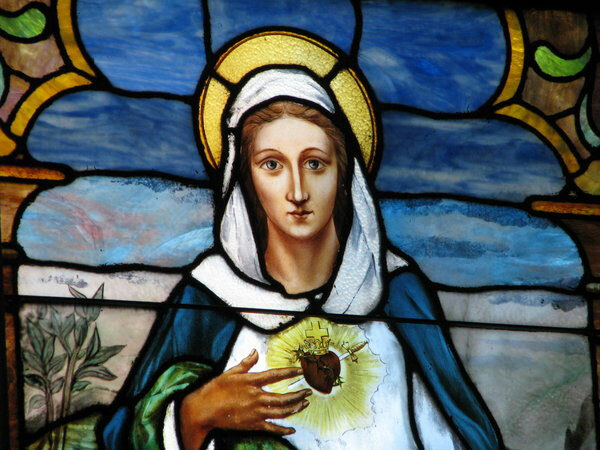 The Compassionate Heart of a Blessed Mother. I grew up in Mary’s Land — both geographically and theologically. I grew up at Holy Family School, just across the Potomac, in Hillcrest Heights, Mary-land. Now MARY (quite impossibly!) is what every little Catholic girl wants to be when she grows up. Well maybe not when she grows up but what every little Catholic girl wants to be in the Christmas pageant. Really — Mary is what every little Protestant girl wants to be in the Christmas pageant! Alas, it did not come to pass for me until Advent 1983. Pregnant with my second child and obviously not a virgin, at long last I snagged the part of the BVM. Not quite as embarrassing as a liturgical dance, I starred in a three part liturgical drama: PREGNANT WITH GOD. Advent One. Surprised. Uncertain. Shaky. Nauseous. Scared. Advent Two. Blooming. Stretching. Aching. Hoping. Advent Three. Heavy. Swollen. Sleepless. Bursting. I burst into the Magnificat! It was the 80’s and I wore Blessed Mother blue. Now for millennia, Mary has been draped in Blessed Mother blue — beatific Mary with the fat little haloed Baby Jesus in her lap. And in virtually every painting, in every icon, in every stained glass window, Mary, the Madonna, is also the Mater Dolorosa, Our Lady of Perpetual Sorrows. Advent is blue — a season both dark and light — and for four blue Sundays, we’ll walk the way to Bethlehem. We’ll walk beside a pregnant, unwed teenager, named Mary. This messed up world is waiting – waiting for the 2015th time — waiting for a Messiah to be born. And we don’t like waiting. We REALLY don’t like waiting. We want Christmas carols not Advent hymns – but you can’t fast forward pregnancy. It takes nine dark months in Mary’s womb. Nine months of backaches and sleepless nights. Nine months growing larger and larger, groaning with child. 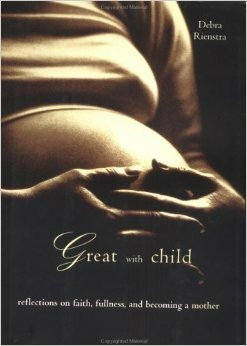 Nine months until the birth pangs begin. Nine months for the kingdom to come. Nine long months to Bethlehem. And once there — there’s no room at the inn. No room for the holy, helpless, homeless family. No room for the refugees. Now just across the river is my home state — Mary’s Land. Maryland is where our religious freedom was born. Persecuted by our own Mother Church, The Church of England – Catholics found refuge there in the 17th century. On these colonial shores they found a safe haven – a safe place to practice their faith and build their lives. In Mary’s Land they found a home. And now Muslim refugees from terror, fleeing the terror of ISIS, crowd our TV screens and climb our FB feed. They clamor for attention, hoping against hope, there will be room in our inn. And their hopes are not founded in vain; their hopes are grounded in our history. In Advent, we light this light, this lamp fire that makes the darkness bright, the Light of the World, who the prophet Jeremiah tells us is coming. This Branch of Jesse’s Tree shall execute justice in the land. He shall save his people and his people shall live in safety. A prayer and a promise that all of God’s people, all of God’s children will find room in the inn. So come walk this way. Walk this way to Bethlehem. Categories: Spirituality and Mental Health | Tags: Advent, Madonna and Child, Maryland, Mater Dolorossa, Mother of Exiles, Our Lady of Perpetual Sorrows, Refugees, Theotokos | Permalink. It was Advent of ‘83 and I was pregnant with God. Well at least a little bit pregnant with God. That frosty November, I was new to the Episcopal Church and flattered beyond belief to be joining the worship planning committee. You see, I grew up Roman Catholic and Sunday services were just endless reruns of Father Knows Best. We lay folks stayed glued to our pews. Fenced off from the altar by a rail, we knew our place. Only the priest was allowed to perform those magical mysteries and pronounce God’s hocus-pocus. So miracle of miracles in Advent of ’83 at Immanuel-on-the-Hill, and pregnant with my second child, I played the Theotokos. I played the Theotokos in a very awkward and makeshift, hippy-dippy liturgical drama – Mary, Pregnant with God. Such a brilliant narrative arc! It was a three Sunday cycle through the three trimesters. On the fourth Sunday: pant; blow; PUSH! It was my shortest pregnancy of record – so different from the previous three. Seasickness on land; nauseated with just one whiff of coffee (Best pregnancy test ever! I love the smell of coffee. ); expanding waistline; swollen feet; wobbly gate; expansive in mood; energetic in spirit; exhausted by the smallest of efforts; cranky and uncomfortable; floating on hope; anxiety ridden; excited as hell; bursting with life. Ladies, did I leave anything out? You know that horrible hymn? Come labor on? Well God blessed me and gifted me with wide-birthing hips. So assisted by my friend, Gravity, I did not labor long. I delivered my firstborn, Zach in just two and a half hours. Dainty daughter, Colleen was born in just four. And Jacob, number three, was nearly spontaneously birthed on the sidewalk outside the Emergency Room. There was no time for drugs. There was barely time to get to the hospital and push. So with the baby born and nuzzling at my breast, naturally manic me was euphoric squared, euphoric to the 1000th power. Blissfully exhausted and wide, wide awake, every little fiber of my being was belting out the Hallelujah Chorus. For unto us a child is born, unto us a child is given! Now everyone has given birth. Be ye male or female, young or old, everyone, everywhere has given birth. Made in the image of the Creator, we are all fertile souls. And even if we are not in the business of procreation, we are all in the business of co-creation. Over the course of the last nine (well actually eight) months, I birthed my fourth amazing child. And at sixty years of age, this is more than a minor miracle! Back in September my bipolar brain conceived her. Formed in the pit of my stomach. Nourished by my frazzled flesh and bones. She kicked my insides and stole my sleep. A labor of love, she stretched me beyond knowing. Expanding in the dark — she was born in the light. This past Saturday on April 25th. SpeakeasyDC was both birth coach and midwife. Unhinged is her name. Eight amazing storytellers told eight amazing stories about living with mental illness, loving someone with mental illness, and working in the field. Three hundred people packed the house. Laughter, tears, understanding, and standing ovations. The truth was told: my truth, their truth, our truth, God’s truth, nothing but the truth. Labor pains and stretch marks, the truth will set you free. So friends, ready to get a little bit pregnant? Categories: Spirituality and Mental Health | Tags: bipolar disorder, Birth, Clergy, Co-Creation, faith, Mania, mental health, Pregnancy, Procreation, SPEAKEASYDC, storytelling, Theotokos | Permalink.